Looking to spark imaginative learning when school is out? Our hands-on, minds-on one-hour science programs enable children to work closely with a Mad Scientist to explore a variety of science topics through fun experiments, exciting activities, and spectacular discussions. Children participate in inquiry-based discussions and take home projects that they have made themselves like model rockets, periscopes, Mad Science putty, and more! With topics ranging from rocketry and magnets to polymers and electricity, kids become turned on to the science that is around them every day and realize it's COOL! Our fun and fully-trained instructors come to you with all the materials necessary to run our dynamic multi-week programs. We can even administer the registration process for you! 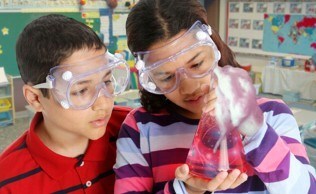 All of our program curricula have been developed and tested by the internationally acclaimed Mad Science Group. One of our offerings, the NASA Academy of Future Space Explorers, is an After School Program that was jointly developed between the Mad Science Group and the NASA Langley Center for Distance Learning. Since children learn by doing, all of our in-class workshops and after school programs are project-based and often include a "make and take" project that the children construct or use during class and then bring home. In addition to any make and take projects that the children complete, they also take home a card after each class that summarizes the day's activities and that provides an additional experiment that they can conduct at home to help encourage parent involvement. We keep the children engaged by using fun, safe, hands-on/minds-on inquiry-based methods presented by dynamic Mad Scientists.